Tabletop Simulator has online and offline game modes. In the Home menu you can choose how you want to play or just learn the basic commands through the tutorial. You can play any board game you have downloaded, but without automatic mechanical. It works as if you play at a table with friends and everything is done by the users, but in a virtual environment. The secret to enjoy the game is on the Steam Workshop, which is actually outside the application. Exit the game and open the Steam, where it is sold, and click the Workshop option - a kind of public workshop that brings together creations of fans through modifications. 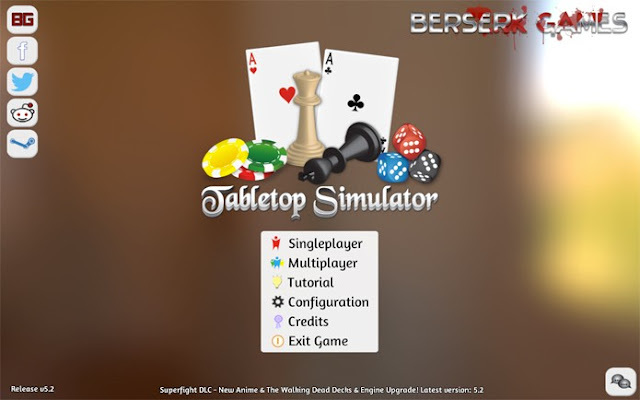 There you will find several games created by fans for use in Tabletop Simulator. You can search by name, see the latest, the best-voted and so on. Install the Tabletop Simulator, With the chosen game, you should be able to download it automatically. To download, just choose the game and click "Subscribe". Back in the game, the start menu you can choose whether you want to play online or offline. In offline mode you can play with your friends on the same computer, where each will play in turn. But the online allows you to create a room to invite other friends or join a public room, someone who has made available a board game for anyone to enter. So just choose the most interesting room and enter. The download additional game will be done automatically. Back in the game, go to the option of playing. You will be taken to a choice of games screen. Some created within the application and ready for use without the need to download, like checkers, backgammon, chess, cards and even basic pieces of RPG. The key, however, is in the Workshop button in the top menu. By clicking here, you will find the screen with the mods downloaded workshop and installed in the game. There is no limit to the available modifications, only the hard disk space of the computer, and you can select which one you will play. In this tutorial we choose the Game of Life. With the chosen game, just enjoy it according to the rules you already know. The commands allow giving any desk, parts and perform moves like rolling dice, deal the cards or any other action required. Everything is detailed in the initial tutorial, especially the commands for each share of players at the table. As we mentioned, nothing is automatic in Tabletop Simulator. The game works just like a platform on which you install board games for free and enjoy with friends or strangers via network. Just follow the rules and enjoy as if at the table with them, but within a virtual environment.